Fancy schmancy. 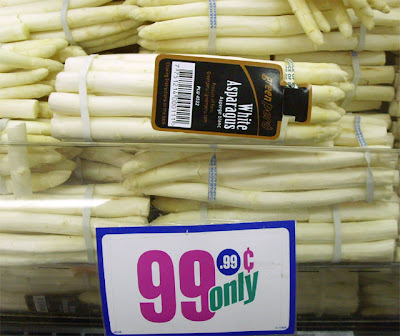 The Chef picked up a few 99.99c bundles of white asparagus at this 99c only Store Friday. I hope they are still selling it today. 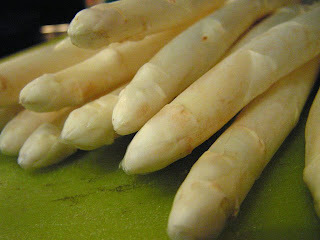 White asparagus is delicate in flavor, a more subtle asparagus -- the taste equivalent difference of light Pabst Blue Ribbon to regular Pabst Blue Ribbon beer. Looking for a special way to prepare this high-end side, The Chef Googled and found a Wolfgang Puck recipe listed on The Food Network's website: Austrian White Asparagus with Brown Butter Sauce. The one-pound bundles of asparagus are peeled, steamed and added to brioche bread crumbs sauteed in brown butter. It is quite simple to make and all ingredients are from local 99c only Stores (while said store does not carry brioche crumbs, they do carry cardboard tubes of Italian or plain breadcrumbs - a fine substitute). Wolfgang's recipe is heavy with butter and bread crumbs. The Chef has the audacity to cut amounts in half -- he sometimes makes an attempt to lighten his calorie intake. An appropre combination would be to serve it over last month's Deal of the Day, Orecchiette with Broccoli, also found at 99c only Stores. The Chef has a few frozen bags at the ready to heat up and top with White Asparagus in Brown Butter Sauce. 1/2 small stick of butter (2 oz.) or substitute. Okay to use olive oil. Trim about 1 to 2 inches off ends of asparagus spears. Peel and low boil for 5 minutes in a pot with enough water to cover asparagus, then remove and set aside. 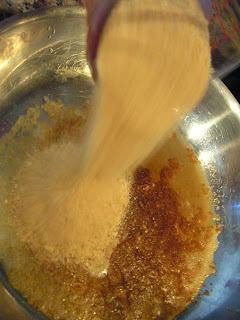 In a frying pan, melt and brown butter over medium heat for about 5 minutes, then add bread crumbs. Cook another 5 minutes. 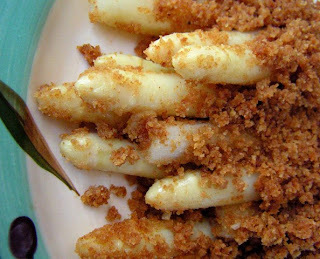 Combine asparagus with sauteed bread crumbs, heating through a few minutes. Serve over pasta or as a side. Wow, I'm amazed at all the great produce! I have to say living in TX, there is far less variety and availability of items at discount stores, especially produce. I will give this "99 cents only" a second look though. Wasn't Pabst in downtown or the Brewery or somewhere local? I'm spending my days at pasadnaadjacent.com but your blog doesn't seem to want to allow me any self promotion.